New York is the second largest forex market center after London; it opens at 8:00 AM – just in the middle of the London session. It also marks the end of the current trading day, as trading activity slows down in its afternoon session until the fresh opening of the markets in Asia. The majority of trades in the New York session are executed in the morning session between 8:00 AM and noon, when the European markets are still open. 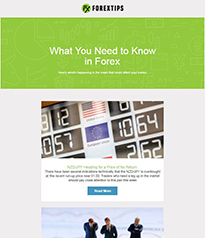 It is also important to note that most economic indicators and reports are published just before the opening of this session, and thus have a great impact on the U.S. Dollar which is involved in about 85% of all forex trades. The volatility tends to wind down after the London session closes at 12:00 PM. This is especially true on Fridays, when it’s common that markets make a small reversal as U.S. traders close their positions and lock in profits ahead of the weekend. 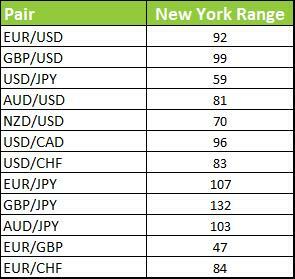 The following table tabulates the average pip ranges of currency pairs during the New York session. For traders who are more risk-tolerant, EUR/USD, GBP/USD, USD/CAD, EUR/JPY and GBP/JPY are pairs to consider as most of them have average daily ranges of above 100 pips. Any pairs involving the U.S Dollar are volatile during the New York session, as foreign investors need to exchange their domestic currency for U.S. dollars to participate in the U.S. bond and equity market. As with the London session, GBP/JPY is the most volatile currency pair in the New York session while it overlaps with the London trading hours. Although trading currency pairs with high volatility is lucrative, traders need also to pay attention to the increased risk while doing so. Cross-pairs that don’t directly involve the U.S Dollar are also affected by the New York session. The reason for this is that these pairs usually involve two transactions to be performed to execute a trade. For example, to open a short position on AUD/JPY, this will involve both AUD/USD and USD/JPY. First, Australian dollars need to be exchanged to dollars, which are then used to buy Japanese yen. This is why the New York session has an indirect impact on cross-pairs as well, increasing their volatility. For more risk-averse traders, EUR/GBP, USD/JPY, AUD/USD and NZD/USD have comparably lower volatility but are still pretty active during the New York session. Traders can also use the lower volatility to concentrate on more long-term trading strategies that involve macro and fundamental trading. The US/New York Trading Session! 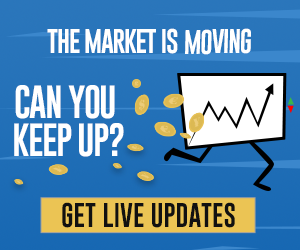 The majority of trades in the New York session are executed in the morning session between ____ EST and ____ EST , when the European markets are still open. As with the London session, GBP/JPY is the most volatile currency pair in the New York session while it overlaps with the London trading hours. Pips and Profits: How do They Work Together?